Find out the stories behind the lyrics of electronic music in a brand new episode of Behind The Lyric presented by Marcie! Episode 024 will feature exclusive interviews with Nick Warren of Way Out West, Betsie Larkin, Anousheh Khalili, Norman Doray, Niles Mason, Marcie, Richard Grey, Stephan M, Alessia Kay, and Kristina Casolani. 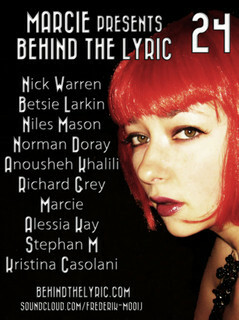 Catch Behind The Lyric 024 this Thursday June 16 at 7:00 PM Eastern / 01:00 CET (Fri) / 12:00 AM UK (Fri).